The natural gas Honda Civic has been replaced by the Mitsubishi i-MIEV as the greenest car in America. Mitsubishi's new electric vehicle, the i-MIEV, has done the unthinkable: It has taken over the title of “greenest car in the U.S.” from the natural gas-powered Honda Civic. Mitsubishi EV vehicle becomes the first electric vehicle to take the top spot in 12 years; beating out the CNG-powered Civic, which had controlled the top spot for eight straight years. The Civic fell to second place, tying with the Nissan Leaf EV. The official list was just unveiled at greencars.org courtesy of the American Council for an Energy-Efficient Economy (ACEEE), a Washington-based environmental lobbying group. Now in its 14th year, the annual list compiles a list of the 12 “Greenest” vehicles in America based on several factors. A vehicle’s “Green Score” consists of single measure that encompasses fuel consumption, unhealthy tailpipe emissions, and emissions of gases contributing to climate change. This year’s data included changes to reflect new natural gas extraction practices as detailed in ACEEE’s Green Book. Based on ACEEE’s criteria, the Mitubishi i-MIEV earned the highest Green Score ever awarded, 58. Making its model year debut this year, the i-MIEV boasts a combined city and highway fuel economy of 112 miles per gallon equivalent. 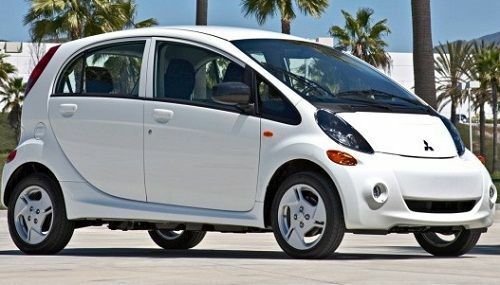 Introduced overseas in 2009, the MIEV became available in the U.S. in December 2011. The car's base price is $29,125, not including the federal tax credit and other California-based incentives. Although the Honda Civic Natural Gas has improved its fuel economy in 2012, it could not retain it top spot, typing with the Nissan Leaf in second place. Rounding out the top five are the Toyota Prius and the Honda Insight. Noticeable absent from the ACEEE list were new hybrid vehicles produced by Hyundai, Kia and Infiniti, none of which could crack the top twelve. Also, no domestic cars made the “Greenest” list. Aside from the “Greenest” vehicles, ACEEE also recognizes the “Greener Choices,” a list ranking the best environmentally sound options in specific categories. This year’s top trucks and SUVs were the Chevrolet Equinox, Ford F-150 and Ford Escape Hybrid. The Chevrolet Sonic-5 and Hyundai Sonata also earned high marks in their respective classes. Not to be left out, the industry’s biggest environmental offenders were also named as part of the annual “Meanest” list. Topping the list of vehicles with highest emissions are the Chevrolet G3500 Express and GMC cargo vans. The car with the highest pollutant factor was the Bugatti Veyron sports car. I finally got a real test drive in the mi-EV last week. I was able to take it to places that really challenge my DIY Pb-SO4 EV; up steep hills, up long uphill grades at highway speeds, entering from steep freeway ramps in to fast moving traffic. I drove it as if it were a gasser, and it was FUN.. Great handling, tight turning circle, adequate acceleration for daily use. though it will need some tweaking for the race track. Still haven't had the chance to get a real test drive in a LEAF. If one can't afford a Tesla,[even MORE fun], the mi-EV is certainly a fun second.